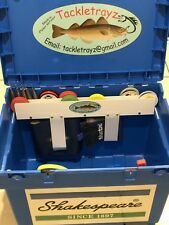 SHAKESPEARE FLOAT & TACKLE BOX WITH just one of the REMOVABLE TRAYS. Condition is Used. LID LIFTER KIT. The Lid Lifter Kits can be fitted as a single unit or as a pair as shown in the photo. SHAKESPHERE BETA & TEAM BOX. D Ring for landing net. Adjustable carry strap. Waterproof 600x300D Material. Shakespeare Scatola Team Sedile affrontare vassoi per argani Rig, LINEA, filo di esche, ecc. These trays fit the Shakespeare Team seat box Hand Made from flexible plastic, easily cleaned. Polycarbonate clips to help keep items secured to the box out of the way of sand and water. Designed for the angler that wants everything to hand. Space saving Slim trays to hold scissors, bait elastic , rig winders, line, etc. Allowing bait bucket, flasks, reels to be carried with ease. The 2 easy fit trays that you get Comes complete with all stainless steel fixings. To fit the popular Shakespeare team box Please note:- box and terminal tackle are for picture purposes only. You are buying the two trays only. There has never been a safer way to protect a pole or rod when sitting on a seat box and now we have available a pole seat cushion that will fit Grandeslam, Shakespeare and Daiwa style team seat boxes and allows you to sit on the pole without having to hold your pole or rod whilst resting or feeding. The Seat Box Sherpa From Shakespeare Requires No Drilling Or Fixings. It Is Fitted In Seconds And Makes Carrying A Heavy Box Much Easier. This Strong Yet Light Carrying System Fits Most Tackle Seat Boxes On The Market. This Rig Winder Tray has been designed to fit the underside of the seat box lid and takes the standard sized rig winders. The Rig Winder Tray. It is available for the beta sized seat box and there are 3 options available, a Short version, A Long version and a Clip On version. The New Breakaway Backrest conversion fits onto the new shakespeare seat boxes the best one for the job is the NEW Beta box. For years anglers have struggled along shingle beaches with boxes slung across one shoulder either slipping and sliding or slowly strangling there owner. So now if you have a broken catch on your Shakespeare Beta Box there is no need for despair and no need to go out and buy a new seat box. This Seat Box Catch Repair Kit has been specifically designed to fit the Shakespeare Beta Box. SMALL SPOOL TIDY KIT. ON 2ND PICTURE IT'S FIRST SPOOL TIDY LEFT-HAND SIDE. SHAKESPHERE BETA & TEAM BOX. Designed to hold spools of main line, shockleader line or even snood line, so no more hunting around in the bottom of the seat box for your spools. This UNIVERSAL TRAY TIDY KIT has been designed to fit the BETA seat box and takes YOUR BITS AND PIECES TO TIDY BOX UP. 1 X SMALL / MINI UNIVERSAL TRAY TIDY KIT (LONG VERSION ) COMPLETE. SHAKESPHERE BETA BOX. Competitive prices checked daily for the best value. Competitive Prices Checked Regulary. • Options -. Proceeds Charity to Angling Projects in Wraysbury. TWO SHAKESPEARE PADDED REEL BAGS. Used but in very good condition. Agility Rig Wallet. - Supplied with 20 re-sealable and removable PE rig wallets. - Compact design. Images for illustration purposes only. - Waterproof 600x300D polyester material. Size 20.5 x 15 x 5cm. For years anglers have struggled along shingle beaches with boxes slung across one shoulder either slipping and sliding or slowly strangling there owner. Once you have arrived at your peg the best you have got is an uncomfortable box to sit on. FOR NEW SHAKESPEAR BOX. The 'SPOOL TIDY' range. Shakespeare nuova sede scatola Tackle vassoi per argani Rig, LINEA, filo di esche, ecc. These trays fit the New Shakespeare seat box Hand Made from flexible plastic, easily cleaned. Polycarbonate clips to help keep items secured to the box out of the way of sand and water. Designed for the angler that wants everything to hand. Space saving Slim trays to hold scissors, bait elastic , rig winders, line, etc. Allowing bait bucket, flasks, reels to be carried with ease. The 2 easy fit trays that you get Comes complete with all stainless steel fixings. To fit the New Shakespeare seat box (with the revised catches) Please note:- box and terminal tackle are for picture purposes only. You are buying the two trays only. 1 X DOUBLE TUBE FLOAT TIDY KIT. DO YOU HAVE A SHAKESPEARE SEAT BOX YOU USE FOR COARSE MATCH FISHING THEN THIS IS FOR YOU.DOUBLE TUBE KIT TO FIT INSIDE YOUR BOX TO KEEP FLOATS,DISGORGERS ETC SAFE. SHAKESPHERE BETA BOX. A quality cool bag perfect for keeping bait in good condition and drinks and food cool. Colour: Blue. The Shakespeare Agility Bank Bag is made from waterproof material 600 x 330D. LID LIFTER KIT. """THE DOUBLE IS FOR WHEN YOU HAVE REEL HOLDERS INSIDE THE LID"""" - NO REELS THEN SINGLE LID LIFTER KIT WILL DO. The Lid Lifter Kits can be fitted as a single unit or as a pair as shown in the photo. Competitive prices checked daily for the best value. Price Checked. • Options -. • D ring for landing net. Reel case that will take up to a size 60FS reel. Competitive prices checked daily for the best value. Competitive Prices Checked Regulary. Price Checked. • Options -. • 500x300 D/PVC. D Ring for landing net. Large Outer pocket 30x24cm. Adjustable carry strap. Shakespeare Seatbox Cushion. Shakespeare Seat Team Box Cushion. made with love by. 47cm x 33cm x 5cm. Fits the new 2018 seat box. A practical rucksack with waterproof PVC backing. Designed to be big enough to carry all the gear required, it's also comfortable to carry. Competitive prices checked daily for the best value. • Options -. Agility Cooler Bag. A quality cool bag perfect for keeping bait in good condition and drinks and food cool. Images for illustration purposes only. 56 x 38 x 37cm. Maintained by:anglerscorner_uk. Sigma Pocket Bag. - 1 x outer pocket. Images for illustration purposes only. Maintained by:anglerscorner_uk. - 2 x internal pockets. - Adjustable carry strap. - Waterproof 600x300D Material. Seatbox not included. The Seat Box Sherpa from Shakespeare requires no drilling or fixings. It is fitted in seconds and makes carrying a heavy box much easier. This strong yet light carrying system fits most tackle seat boxes on the market. Agility EXP Rucksack. add to that the bits belt that can be used also when wading and you have another classic addition to the Shakespeare Agility family. Agility EXP Luggage. Other details Images for illustration purposes only. The carry strap is padded and adjustable and also has 2 strong comfortable carry handles. Competitive prices checked daily for the best value. • Options -. • 60x19x42cm. Sigma Single Reel Case. Reel case that will take up to a size 60FS reel. Images for illustration purposes only. 42 x 40 x 38cm. Maintained by:anglerscorner_uk. Storz Accessory Tackle Box System. Size Small. Secure clamp closing. 23.6 x 22.2 x 6.3cm. 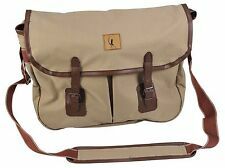 Classic looking trout bag with a faux leather flap adding to the style. Adjustable shoulder strap. The bag can be fitted to the outside or inside of your Shakespeare box using the slots designed for trays. I developed this waterproof bag for myself to support my boat fishing activities. The bag has a clip, and a belt strap. For 2018 New Shakespeare Seat Box / Sea Fishing. Backrest and harness for new Shakespeare box as the lid is deeper on this box the original Backrest wont allow the lid to open fully. Now with the longer brackets this one will allow the lid to open. The Shakespeare Agility Rise Brook Bag is made from a waterproof 600 x 330D material. AGILITY RISE BROOK BAG. 25 WESTFIELD AVENUE. LEEDS - 30 MILES - 40 MINS. SCUNTHORPE - 25 MILES - 35 MINS.